Size: 1,200 sq. ft. "more or less including Florida Room and storage"
This 2/2 completely furnished 1998 PALM HARBOR has vaulted ceilings, and a spacious open floor plan. A river doesn’t run through it but a creek runs behind it. No backyard neighbors. This community is 10 miles from the Gulf Coast and close to the best of what SWFL has to offer. The Heritage is your very own 55+ RESORT home. Swimming, hot tub, free golf, bocce ball, ping pong, tennis, horse shoes, shuffleboard, professional billiards tables, professional poker tables just start the amenities! This unit is has over 1,100 sq ft including the Florida Room and storage, and has an extra-long decorative driveway. This home is perfect for entertaining friends and family or relaxing after a hard day living your Florida lifestyle at the Barbara B Mann Performing Arts Hall, the Edison-Ford Winter Estates, the Lee Civic Center, the Boston Red Sox and the Minnesota Twins spring training, Fort Myers Historical Museum, Lee County Arts Center, Miromar Outlets, Tanger Outlets, on the nearby beaches of Fort Myers Beach, Sanibel, and Captiva or in the beautiful, friendly gated Heritage. Beautifully maintained grounds with 9 fishing lakes, a 9 hole executive golf course , fully equipped fitness center with fitness programs, Olympic size swimming pool with a whirlpool spa and NO EXTRA CHARGES FOR ANYTHING!!! (INCLUDING GOLF). LOT RENT of $685 includes LAWN CARE, and ALL AMENITIES. WATER, SEWER, TRASH are provided by the community for a small fee. Prior to purchase must have park approval. Motorcycles allowed in restricted areas. Let’s make your dream of living in Florida a reality. 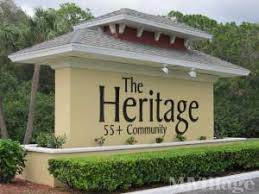 The Heritage is a 55+ Community (40 if the quota isn’t met). Buyer/s must be park approved.